 starter activity Try the Stresemann challenge! You have 2 minutes to revise your notes or look at p.26-7 in your text book and then you fill face 5 questions. 1  starter activity Try the Stresemann challenge! You have 2 minutes to revise your notes or look at p.26-7 in your text book and then you fill face 5 questions on his life! 2 ???Quiz??? 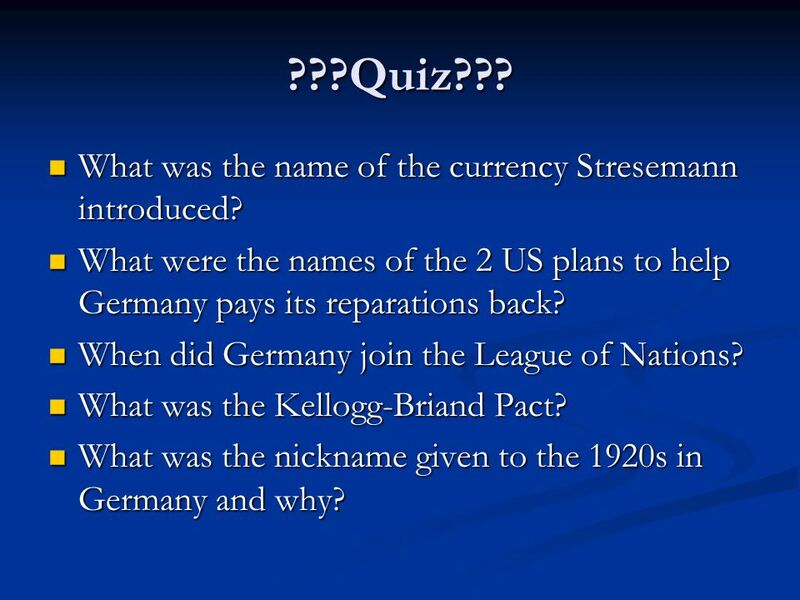 What was the name of the currency Stresemann introduced? What was the name of the currency Stresemann introduced? What were the names of the 2 US plans to help Germany pays its reparations back? What were the names of the 2 US plans to help Germany pays its reparations back? When did Germany join the League of Nations? When did Germany join the League of Nations? What was the Kellogg-Briand Pact? What was the Kellogg-Briand Pact? What was the nickname given to the 1920s in Germany and why? What was the nickname given to the 1920s in Germany and why? 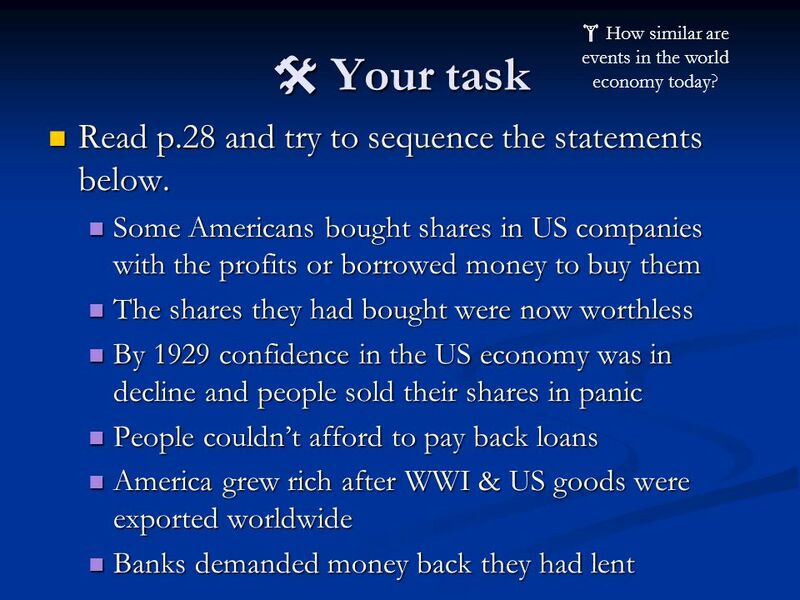 6  Your task Read p.28 and try to sequence the statements below. Read p.28 and try to sequence the statements below. Some Americans bought shares in US companies with the profits or borrowed money to buy them Some Americans bought shares in US companies with the profits or borrowed money to buy them The shares they had bought were now worthless The shares they had bought were now worthless By 1929 confidence in the US economy was in decline and people sold their shares in panic By 1929 confidence in the US economy was in decline and people sold their shares in panic People couldn’t afford to pay back loans People couldn’t afford to pay back loans America grew rich after WWI & US goods were exported worldwide America grew rich after WWI & US goods were exported worldwide Banks demanded money back they had lent Banks demanded money back they had lent  How similar are events in the world economy today? 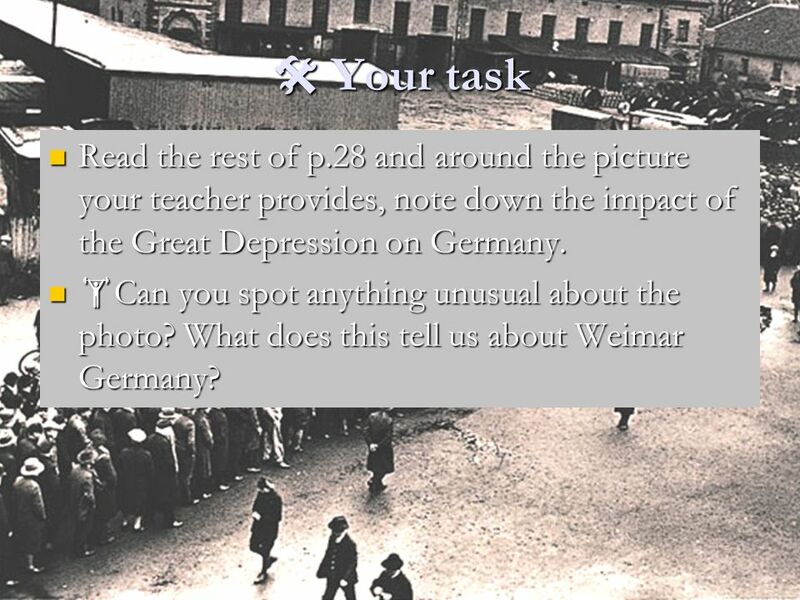 8  Your task Read the rest of p.28 and around the picture your teacher provides, note down the impact of the Great Depression on Germany. Read the rest of p.28 and around the picture your teacher provides, note down the impact of the Great Depression on Germany.  Can you spot anything unusual about the photo? 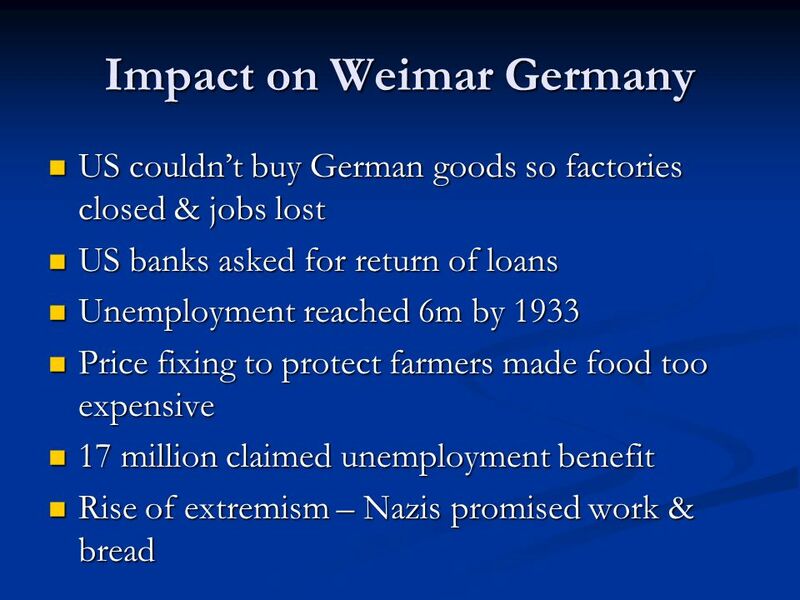 What does this tell us about Weimar Germany?  Can you spot anything unusual about the photo? What does this tell us about Weimar Germany? 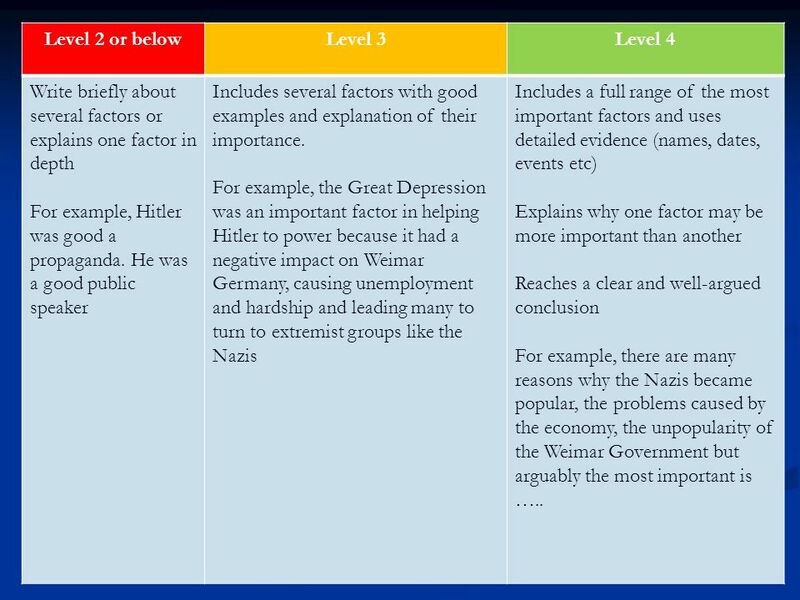 12 Level 2 or belowLevel 3Level 4 Write briefly about several factors or explains one factor in depth For example, Hitler was good a propaganda. He was a good public speaker Includes several factors with good examples and explanation of their importance. 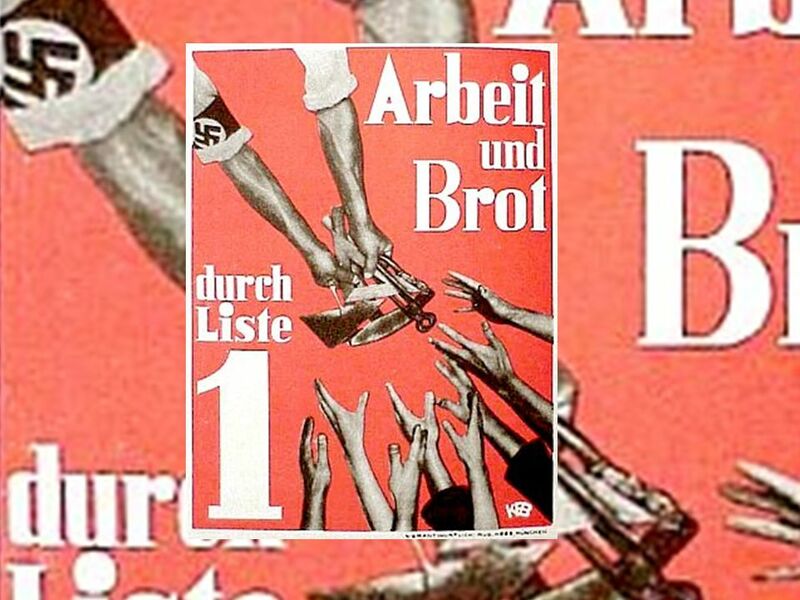 For example, the Great Depression was an important factor in helping Hitler to power because it had a negative impact on Weimar Germany, causing unemployment and hardship and leading many to turn to extremist groups like the Nazis Includes a full range of the most important factors and uses detailed evidence (names, dates, events etc) Explains why one factor may be more important than another Reaches a clear and well-argued conclusion For example, there are many reasons why the Nazis became popular, the problems caused by the economy, the unpopularity of the Weimar Government but arguably the most important is …..
13  Homework Finish off your essay for homework. At the bottom explain what level your work is and if you don’t think it is Level 4 what you would still need to do to improve it further. 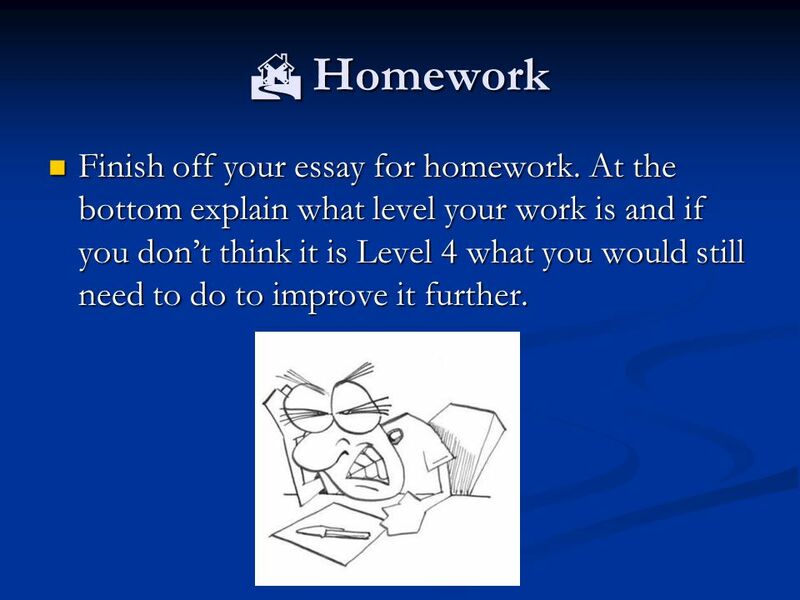 Finish off your essay for homework. At the bottom explain what level your work is and if you don’t think it is Level 4 what you would still need to do to improve it further. 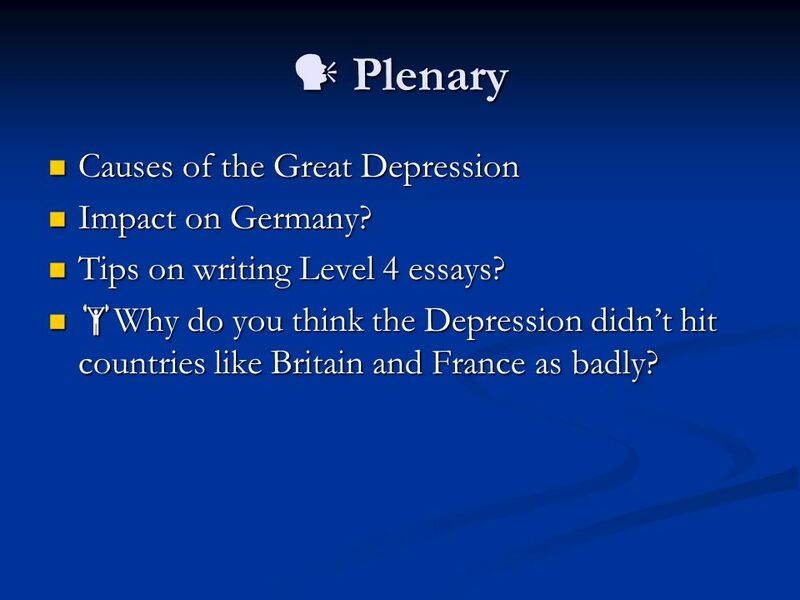 14 Plenary Plenary Causes of the Great Depression Causes of the Great Depression Impact on Germany? Impact on Germany? Tips on writing Level 4 essays? Tips on writing Level 4 essays? 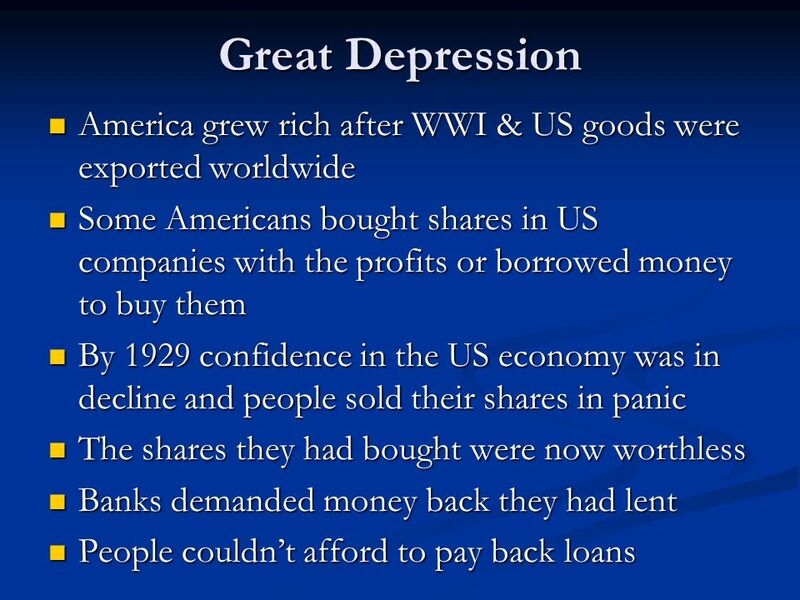  Why do you think the Depression didn’t hit countries like Britain and France as badly? 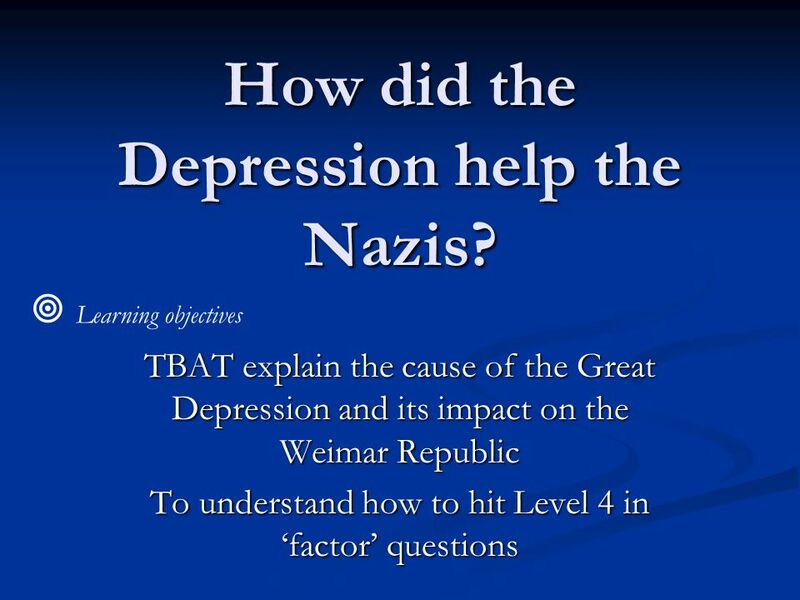  Why do you think the Depression didn’t hit countries like Britain and France as badly? 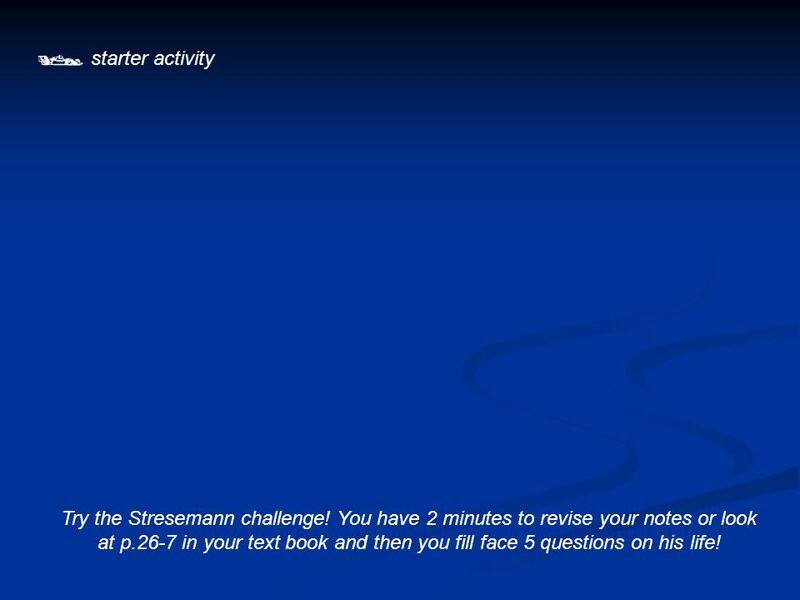 Download ppt " starter activity Try the Stresemann challenge! You have 2 minutes to revise your notes or look at p.26-7 in your text book and then you fill face 5 questions." What did Stresemann do? Golden Era of Weimar Period of Stability after the problems of the early Weimar Republic Period of Stability. 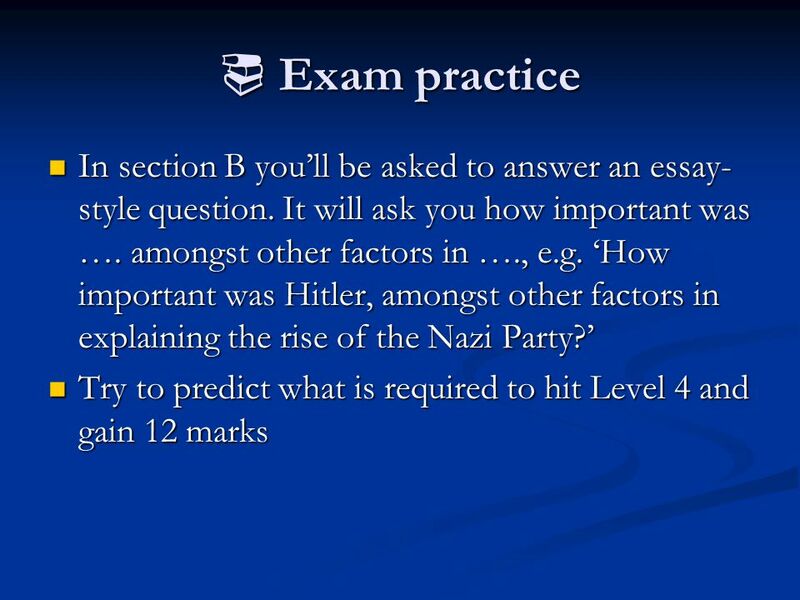 GCSE History - Paper One 2 hours 45% of your final grade Section A – International Relations c You will have to answer one source- based question. Name _____________________ Germany’s Economy After the War Signed at the 1919 Paris Peace Conference, the Treaty of Versailles — the formal agreement that. Starter Activity Write definitions for the following ‘Key Terms’ in your exercise books. You will need these to help you get the best marks in the exam! 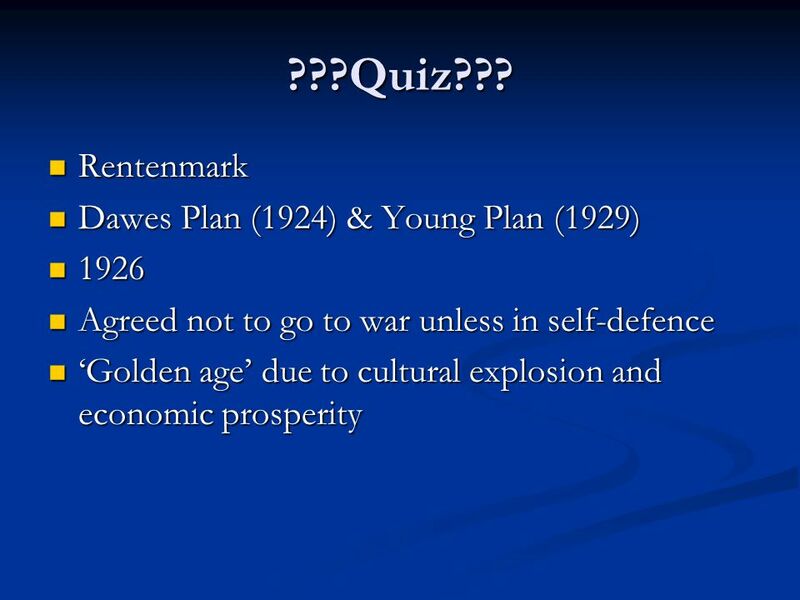 Learning Objective: To understand how successfully Stresemann dealt with Germany’s problems. Knowledge Connections Definition Picture Term Vocabulary  Inflation. The Great Depression. 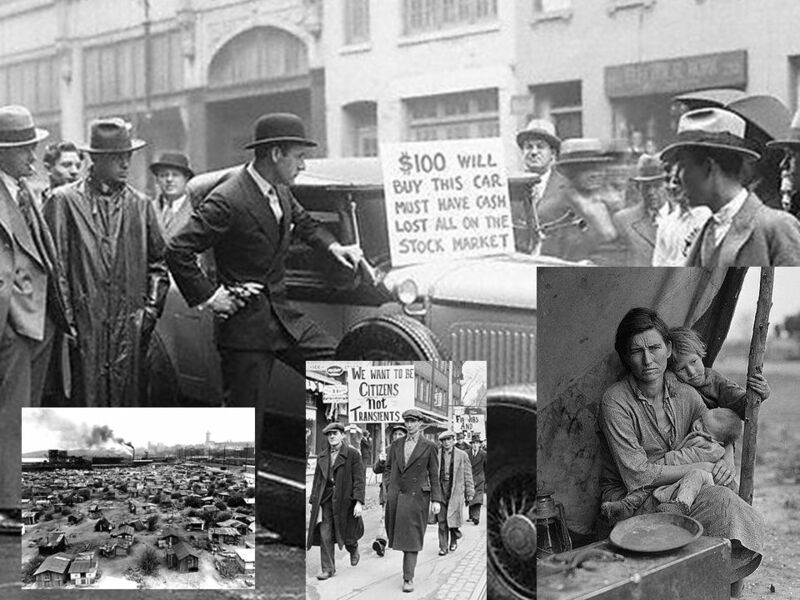 What was the Great Depression? Time of economic crisis characterized by high unemployment during the 1930s, the beginning is marked. Worldwide Depression. Postwar Europe The Great War left every major European country nearly bankrupt Most European nations had democratic governments. Essential Understanding: Essential Understanding: A period of uneven prosperity in the decade following World War I (the 1920s = the “Roaring. 17-1.  Weak League of Nations ◦ US Senate refused to approve ◦ League members disagreed on using force  French Demands ◦ Strict enforcement of Treaty.